Let's be real: Harry Potter fans are unique in many ways. There are so many wonderful fandoms, but something about the Harry Potter fandom just feels a little more magical. Maybe I’m biased, because I grew up reading the series, but I think that Harry Potter is a truly special experience, and I’m so grateful to have so many fellow fans who feel the same way (right down to the insane fan theories). Of course, timing played a huge factor in creating the fandom we all know and love today. If it weren’t for the era of the Internet, we wouldn’t be able to connect fans of all ages and countries and stages of life. But because J.K. Rowling had the idea for a story of a boy wizard at the right time, we ended up with the huge fandom experience that we have now. You’re probably a part of lots of fandoms. After all, it’s not a rule that you have to belong to only one — unlike the typical literary “sorting,” you can consider yourself a part of as many fandoms as you want. But if you’re a HP fan, you know the truth: there are just some things that make Harry Potter fans different than other fandoms — and here are some of the big ones. Literary food is always fun to attempt, but no one is dedicated to a feast like a Harry Potter fan. I bet fans can't recall many food items eaten in Divergent or Star Wars or even The Hunger Games (shocking, right?). But if someone asks you what the students are eating at Hogwarts, you'll gush about pumpkin juice, treacle tart, Butterbeer, pasties, cauldron cakes, and more. And, of course, you'll have to share all your recipes. Perhaps only LOTR fans could match Harry Potter fans for appetite. So many YA books have an element of sorting in the plot. There are factions in Divergent, "the trial" in Marie Lu's Legend, uglies and pretties in Uglies, community assignments in The Giver. The difference with HP is that it's a (mostly) positive thing to be sorted into a house at Hogwarts. There are no dark undertones here, no controlling society to rebel against — just Quidditch and house colors and a super cool common room, no matter which house you're placed in. 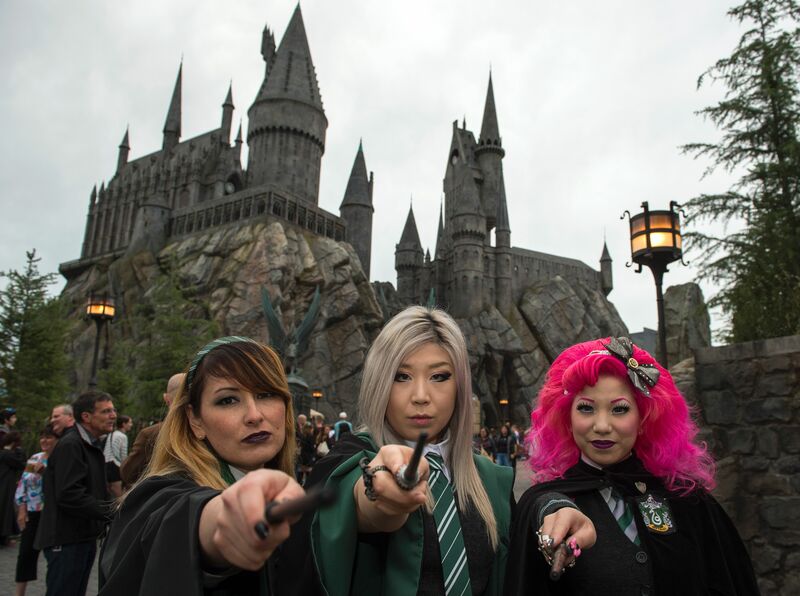 Other fandoms are great at cosplay, but HP fans know how to incorporate Hogwarts apparel into their everyday outfits. Gryffindor scarf? Check. Harry Potter nail art? Of course. Weasley sweater? You have a whole drawer full. Whereas many other fandoms had the luxury of reading all their series at once (Lord of the Rings) (Jane Austen), and others didn't have to wait for too many years for the books to be released (Divergent) (the Hunger Games), Harry Potter fans grew up reading the series. And it grew up with them. There's a reason the last movie was so emotional for us: just as Harry, Ron, and Hermione were entering adulthood, so were we. There are so many versions of the Harry Potter series, that at this point, you could have an entire bookshelf just dedicated to different editions. Tempting, isn't it? Harry Potter fans have an entire section of a theme park dedicated to the series, complete with shops and restaurants just as the book describes. And, of course, Butterbeer — because no Harry Potter fan will pass up a chance to eat food from the series. The Hogwarts feasts were epic, y'all. Whereas some fandoms are happy to laugh and cry all together, Harry Potter fans love to obsess over the smallest details and argue about them. Of course, they'll never be truly angry with one another, because a Harry Potter fan is a Harry Potter fan, after all. They quote the series constantly. Word for word. This goes far beyond knowing a ton about the plot: Harry Potter fans know every spell, every homework assignment, and they ship all the ships. There's a reason there are so many fan theories out there — we have a terrifying amount of knowledge about the books and movies. I love her as a character, but I wouldn't want to name anyone "Katniss." I did, however, name my dog Luna Lovegood (To be fair, there probably aren't a lot of Baby Albus Severuses out there. Perhaps just the one). From A Very Potter Musical to Potter Puppet Pals, we know the parodies as well as we know the actual series. All someone has to do is say "Snape, Snape, Severus Snape," and we're off. And we know that Hogwarts is always there to welcome us home.